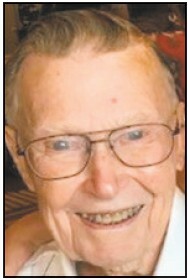 Jay "Rick" Edwards 94, passed away peacefully Saturday February 9th at Humility House in Austintown, Ohio. Born in Kittanning, Pa, the oldest of eight children born to Jay W. and Clara (Larimer) Edwards. Rick was a 1942 graduate of Kittanning High School. He was a WWII veteran serving in the Pacific Theatre, earning the rank of Technical Sergeant. Upon return from the war, he began his career as an appliance repair person at McConnell Waterson store in Kittanning. He later became Manager / Owner of Barron Radio in DuBois, Pa, ending his career as President and owner of Buckeye Marketing Group in Ohio. During his very active life Rick served as Fire Police Chief in DuBois. He was active with the DuBois Masonic Lodge, earning a 32nd Degree from the Coudersport Consistory. He spent many years serving as a clown with Shriner's in Cincinnati, Ohio. A deeply religious man, Rick read the entire Bible eight times and was working on his ninth when he passed away. Rick was married to the former Lillian ( Dougherty) of Cadogan Township for 73 years. Lillian died in December of 2016. During this time they welcome into their lives, Drusilla, who died in infancy, Richard ( Karla ) of Austintown, OH and Ida "Lou" (Tom) King of Kittanning and Tavares, FL. Rick was preceeded in death by his wife, daughter, his parents, brother Bob and Ken, and sisters Marie and Ella "Sis". He is survived by sister Eileen Lundgren of Rural Valley, Connie (Bob) Toy of Sebactodol, CA and Peg (Daryl) Stivinson of Worthington, PA.
Rick leaves to cherish his memory in addition to his children and sisters, numerous nieces and nephews, four grandchildren and ten great grandchildren. Friends will be received from 7-9 p.m., Thursday, February 14 at the Snyder-Crissman Funeral Home, 200 S. McKean St., Kittanning and from 10-11 a.m. on Friday with religious services beginning at 11 A.M. at the Funeral Home. In lieu of flowers, the family requests donations to the Shriner's Hospital for Children, 12502 USF Pine Drive, Tampa, FL 33612.